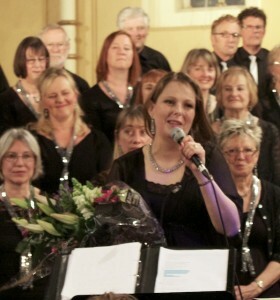 Deepest thanks were given to the wonderful Linda Perry Smith who, after seven fabulous years’ service as Musical Director, is stepping down to pursue other projects. A HUGE thank you for the music and the memories Linda! 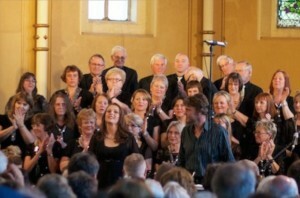 Fortunately, the immensely talented Steve Duckworth (currently Assistant Musical Director) is taking over the helm so the future looks very bright for both the Ashbourne Singers and Young Ashbourne Singers. 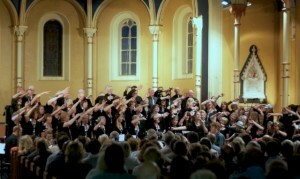 Ashbourne was well and truly ‘rocked’ in a magnificent summer concert by The Ashbourne and Young Ashbourne Singers at St. John’s Church on Saturday 17 May. 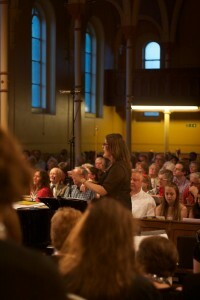 Under the direction of the always ebullient Linda Perry Smith we were treated to ‘Sing the Hits – Bacharach to Barlow’. 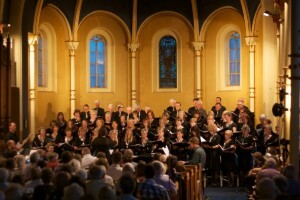 There really was something for everyone as the combined talents of both choirs, accompanied by a fabulous band, rocked us from the 60s all the way to the present day. The evening started with Marvin Gaye’s toe-tapping number ‘Ain’t No Mountain High Enough’ and was followed by other classics from notable artists like Nina Simone, The Everly Brothers and Ben E. King. The latter provided the opportunity for soloist David Sunter, expertly accompanied by Steve Duckworth on piano, to mesmerise us with ‘Stand by Me’. Not to be outdone the 70s were represented by spectacular versions of Eddy Grant’s ‘Walking on Sunshine’ and Queen’s mini opera ‘Bohemian Rhapsody’. 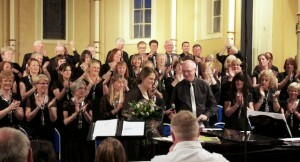 The Ashbourne Singers rendition was spine tinglingly thrilling and was set alight by the vibrant band. No evening would be complete without tributes to both the Beatles and, as the title suggests, Burt Bacharach, their contributions to popular music being second to none. YAS charmed us with wonderful performances of ‘The Lion Sleeps Tonight’ and Journey’s ‘Don’t Stop Believin’: both numbers showcasing the gusto and musical talents of the younger generation. More contemporary numbers by the likes of Snow Patrol, Coldplay and Take That will hopefully become the mainstay of any such concerts in the future as they lend themselves greatly to the singers with their soaring melodies, powerful emotion and contemporary appeal. If one song summed up the whole evening and reflected the high standard of musical direction it would come from a rather unexpected quarter. The Singers’ version of Soft American Rock band Toto’s ‘Africa’ had to be seen to be truly appreciated. The skilful arrangement resulted in the choir enacting the onset of a storm using innovative hand percussion: really entertaining! The evening rounded off with not one but two encores, culminating in the audience joyfully and enthusiastically joining the choirs in song – with actions! 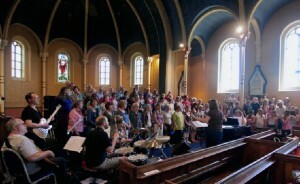 The Young Ashbourne Singers can be seen here rehearsing with the adult choir during the afternoon of Saturday, 17th May.